ww2dbaseEarly in Sep 1941, German troops marched in the suburbs of Leningrad while Finnish troops threatened the city from the north. The city felt the threat long ago, however, and starting early in the summer of 1941, the civilians of the city were summoned to construct an elaborate system of defenses around the city: wooden blockages, barbed wire, anti-tank ditches, and trenches of various sizes. The responsibility of defending the city was given to Georgi Zhukov. 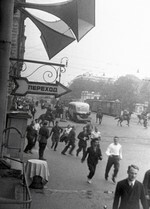 German preparations for invasion started on 4 Sep when artillery shells began to rain on the city, and aircraft dropped bombs beginning on 6 Sep. Zhukov's preparations saved the city from a quick assault; the German troops dug in around the city, and the siege of Russia's second largest city had begun. "thousands of incendiary bombs on the Badayev warehouses, a two-hectare site of wooden buildings that held much of the city's remaining food supplies; the next morning the whole city was suffused with the smell of burning meat, flour, lard and sugar. After this disaster the people of Leningrad had only a few weeks' supply of food left and there was little hope of receiving any more." ww2dbaseThe Winter War that Russia was fighting with Finland had taken a unfavorable turn for the Russians as the Finns marched toward Leningrad from the northwest. The Finnish leader Carl Gustav Emil Mannerheim halted his advance at the Finnish-Russian border of 1939 and refused to go any further. On 4 Sep, Jodl attempted to, unsuccessfully, convince Mannerheim to press on his attack to aid the German efforts in the northern arm of Operation Barbarossa. As a result, although the Finns remained a threat to the Russians until Finland left the Axis alliance in Sep 1944, the Russian defenses were able to put more focus on the German front. ww2dbaseSupplies were of the most critical issue in the defense of Leningrad. Rationing of food was employed immediately as the food situation took a bad start immediately after the German attack: several barges full of grain were sunk at the beginning of the siege (some were recovered by divers later during the siege to alleviate the situation), while a depot with a large stock of food burned from German bombings. The food situation never improved in the next few months, as the Russian leaders in the city feared but yet expected. Food rations had reduced several times since the beginning of the siege, and now had reached starvation levels. At the end of Dec 1941, 3,000 people starved to death daily. ww2dbaseA small gleam of light was found on 20 Nov 1941, however. Daring runs by trucks over the frozen Lake Ladoga brought small amounts of supplies into the city over the "Road of Life". Subsequent runs over the Road of Life brought in small but yet significant supplies. The trucks endured dangerous driving conditions from unstable ice below and German air raids from above, but the supply runs continued. Over this route, 500,000 civilians were also evacuated out of the city throughout the siege. ww2dbaseGerman troops, frustrated by the inability to break Leningrad's defenses, continued to bombard the city continuously. The cultural capital of Russia slowly turned to ruins as the northern arm of Operation Barbarossa turned into a complete stop. Although the Germans did not admit to it, the stubborn defense of Leningrad had already marked a complete failure in the north. "The city is dead. There is no electricity, no trams. Warm rooms are rare. No water. Almost the only form of transport is sleds, carrying corpses in plain coffins, covered with rags or half clothed. Daily six to eight thousand die. The city is dying as it has lived for the last half year - clenching its teeth." ww2dbaseOn 4 Apr, the German Luftwaffe struck at the Russian fleet at the ports of Leningrad, but it failed to destroy the fleet. 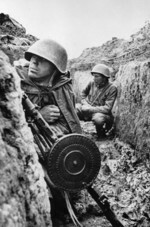 Along with the other ongoing events that frustrated the German forces, morale started to slip on the German side, while the civilians and troops at Leningrad saw the opposite. On the northern front, the Finnish troops remained rather dormant. In hindsight the Finns' lack of cooperation with the German forces became a salvation to the Russian forces, as it allowed them to shift defenses on the German front. The lack of cooperation also meant that the Germans was not able to launch an offensive from the Finn-occupied northern corridor nor shell the city from the north. The Finns held on to the territory immediately north of the city until summer 1944.
ww2dbaseThe siege finally completely ended on 27 Jan 1944 as the last of the German troops withdrew from the region. German shelling lasted until the last days according to Hitler's orders at the start of the siege that Leningrad must be reduced to dust. ww2dbaseThe casualties suffered during the 900-day siege differed according to source. The Russian government reported 670,000 deaths during the siege, with a significant portion to starvation. Others estimate the death toll to be as high as over one million. It was a tragic blow to Russia, however, the will of the people of Leningrad to fight on became one of the more powerful tools of the Russian propaganda machine. For the stubborn defense, Leningrad was given the Order of Lenin in 1945 by Joseph Stalin. She was also the first city to be awarded the honor Hero City in 1965. 15 Jul 1941 Soviet troops began a counter offensive in the Lake Ilmen area near Leningrad, Russia. 19 Jul 1941 Heavy fighting between German and Soviet forces took place near Lake Peipus near Leningrad, Russia. 20 Aug 1941 The German siege of Leningrad, Russia began. 21 Aug 1941 Hitlers ordered that the Russian city of Leningrad was to be besieged, not captured. 30 Aug 1941 German troops captured Mga, Leningrad Oblast, Russia, severing the last railway leading into the city of Leningrad. 8 Sep 1941 Leningrad in northern Russia became completely surrounded as German troops reached Lake Ladoga at Orekhovets. German aircraft attacked the city with primary targets being warehouses that might be holding food. 11 Sep 1941 German artillery bombarded Leningrad, Russia throughout the day. 12 Sep 1941 The daily bread ration in Leningrad, Russia was cut to 500 grams for manual workers and 300 grams for office workers and children under 12. 14 Sep 1941 The German XXXXI Armeekorps (mot[orized]) attacked Soviet positions southwest of Leningrad, Russia, while Soviet troops counterattacked into the flanks of the German assault. 15 Sep 1941 Soviet 8th and 42nd Armies clashed with the German XXXXI Armeekorps (mot[orized]) southwest of Leningrad Russia on the coast of the Gulf of Finland. 16 Sep 1941 The German XXXXI Armeekorps (mot[orized]) successfully cut off the Soviet 8th Army in the Oranienbaum Pocket southwest of Leningrad, Russia after two days of fighting. 18 Sep 1941 Change of German strategy against Leningrad, Russia, switching from assault to besieging, led to the tanks of the German 4th Panzer Army were loaded onto trains at for Moscow, Russia. This shift in strategy partially resulted from Adolf Hitler's order earlier on this date that Leningrad was to be razed to the ground. 21 Sep 1941 German Stuka dive bombers sank Soviet battleship Marat in shallow water at Kronstadt near Leningrad, Russia with two 1,000-kilogram bombs. 23 Sep 1941 German Stuka dive bombers attacked Soviet warships at Kronstadt near Leningrad, Russia, hitting battleship Marat (already sunk in shallow water on 21 Sep 1941) with two bombs, igniting the forward magazine. The shipyard in Leningrad were also attacked, sinking submarines P-2 and M-74; cruisers Maksim Gorki and Kirov were also attacked. 25 Sep 1941 Hitler ordered a halt to attacks on Leningrad in northern Russia, instead ordering that the city be starved into submission. 29 Sep 1941 Adolf Hitler ordered that Leningrad, Russia was to be wiped out by artillery and aerial bombardment. Germany could not and would not feed its population, which was of no use for the future of Germany. 1 Oct 1941 Finnish troops reached Petrozavodsk, the capital of Soviet Republic of Karelia, further cutting off Leningrad in northern Russia. 12 Oct 1941 German 250th Infantry Division of Spanish volunteers was deployed on the River Volkhov near Leningrad, Russia. 13 Oct 1941 General Fedyuninsky was ordered to plan a breakout from Leningrad, Russia by attacking the area south of Lake Ladoga, which was to take place by 20 Oct 1941. 20 Oct 1941 In northern Russia, Soviet General Fedyuninsky launched an attack south of Lake Ladoga with 70,000 troops and 97 tanks in an attempt to break through the Leningrad siege. Meanwhile, German troops moved to attack the rail and road junction at Tikhvin 120 kilometers to the east to strengthen the siege. 23 Oct 1941 The Soviet attempt to break out of Leningrad, Russia south of Lake Ladoga was halted by the Germans. Meanwhile, 120 kilometers to the east, two divisions of the Soviet 54th Army were dispatched to reinforce Tikhvin, which had been under attack by the Germans. 26 Oct 1941 General Fedyuninsky was transferred from Leningrad, Russia to lead the Soviet 54th Army at Tikhvin about 120 kilometers to the east. The relieved commanding officer of the Soviet 54th Army, General Mikhail Khozin, who had previously served in Leningrad in 1938, was assigned to direct the defenses there. 8 Nov 1941 Troops of the German Armeegruppe Nord captured Tikhvin near Leningrad, Russia. 13 Nov 1941 General Kirill Meretskov attacked German troops at Tikhvin, Russia with Soviet 4th, 52nd, and 54th Armies. 17 Nov 1941 Soviets dispatched several small teams to test the thickness of the ice on Lake Ladoga near Leningrad, Russia. 18 Nov 1941 The teams dispatched on the previous day out of Leningrad, Russia to Lake Ladoga returned to the besieged city at 0400 hours, reporting that the ice on the lake was about 10 centimeters thick, which made light travel possible, but not for heavy equipment such as 1-ton trucks. 19 Nov 1941 In northern Russia, Soviet 4th and 52nd Armies continued to attack Tikhvin, held by the Germans, 120 kilometers east of Leningrad. Meanwhile, near Leningrad, General Feofan Nikolaevich Lagunov drove an American-built M1 Scout Car across the frozen Lake Ladoga and declared it safe to use as a truck route. 20 Nov 1941 The daily bread rations in besieged Leningrad, Russia was reduced to 500 grams for military personnel, 250 grams for engineers and technical workers, 125 grams for other workers and children. The situation was hoped to be improving soon, however, as the first successful crossing of the frozen Lake Ladoga was made with horse-drawn sleighs, hoping to bring back food from Kobona. 21 Nov 1941 The horse-drawn sleigh team returned to Leningrad, Russia from Kobona, bringing back flour, sugar, and fat across the frozen Lake Ladoga for the first time since the city was surrounded. 22 Nov 1941 As the ice on Lake Ladoga reached 20 centimeters in thickness, 60 trucks made the crossing, aiming to bring back food into Leningrad, Russia on their return trip on the next day. 23 Nov 1941 60 trucks brought in 33 tons of flour and 2.5 tons of sugars and fats into besieged Leningrad, Russia, driving across the frozen Lake Ladoga; this was the first of many over-ice truck runs that would ramp up to bring in 100 tons of supplies each day. The population of Leningrad, however, required about 600 tons of supplies for survival. 30 Nov 1941 The warming of temperature in the region around Leningrad, Russia meant a decrease in the ice thickness over Lake Ladoga, which led to the decrease of supplies delivered by ground vehicles driving over ice; only 61 tons of food made its way into the city on this date. 5 Dec 1941 Soviet General Meretskov launched a final assault on German positions in Tikhvin, Russia, which was 110 miles east of Leningrad. 6 Dec 1941 The log road between Zabor'ye and Lake Ladoga near Leningrad, Russia was completed. Thousands of civilians, pressed into service as forced laborers, had died during the construction of this road in the past month. This opened another way to bring supplies into the besieged city. 7 Dec 1941 Soviet forces captured Tikhvin, Russia east of Leningrad. 9 Dec 1941 Soviet troops recaptured Tikhivin, northern Russia. 22 Dec 1941 With the ice over Lake Ladoga thickening, Soviet forces began to move tanks across the lake to reinforce Leningrad, Russia. At the same time, trucks brought in 687 tons of food, also over the lake; it was the first time over 600 tons of food were brought in on a single day, which was the minimum daily requirement to feed the population. 23 Dec 1941 Trucks brought in 786 tons of food into Leningrad, Russia across the frozen Lake Ladoga; for the second day in a row, enough food was brought in to feed the population. 25 Dec 1941 Over 3,000 people had died of starvation in Leningrad, Russia to date. 27 Dec 1941 German 250th Infantry Division of Spanish volunteers repulsed a heavy Soviet attack about 100 kilometers south of Leningrad, Russia which began on 23 Dec 1941. 7 Jan 1942 The Soviet Volkhov Front attempted to force Germans back from Leningrad. 18 Jan 1942 Soviet 54th Army broke through German defenses at Pogoste, Russia, 75 kilometers southeast of Leningrad. Further south, Soviet 2nd Shock Army penetrated German lines near Spasskaya Polisk on the Volkhov River. 22 Jan 1942 The Russians commenced a mass evacuation of civilians from besieged Leningrad across the ice road. By Apr 1942, 440,000 would have been withdrawn from the city. 31 Jan 1942 More than 200,000 Russians had died in Leningrad this month from starvation, disease and illness. Reports began to circulate of cannibalism amongst the besieged population. 7 Feb 1942 German troops halted the Soviet offensive northwest of Leningrad, Russia. 19 Mar 1942 German Armeegruppe Nord cut off General Vlasov's Soviet 2nd Shock Army in a salient on the Volkhov River near Novgorod 50 miles southeast of Leningrad, Russia. 4 Apr 1942 62 Luftwaffe Stuka dive bombers and 70 other bombers escorted by 59 Bf 109 fighters attacked Soviet fleet at Kronstadt near Leningrad, Russia in the afternoon, damaging battleships October Revolution and Petropavlovsk, cruisers Maxim Gorky and Kirov, and destroyers Silny and Grozyashchi. After dark, He 111 bombers, some of which had participated in the Kronstadt attack in the afternoon, bombed Leningrad. 5 Apr 1942 Adolf Hitler ordered a renewed offensive in the Leningrad, Russia region in the Soviet Union. 8 Apr 1942 Soviet forces opened a railway link into Leningrad in northern Russia. 10 Jun 1942 Soviet 2nd Shock Army, largely surrounded by German forces on the Volkhov River near Leningrad, Russia since mid-Jan 1942, began to extract itself from its disadvantageous position by using using grounds that were firming up due to the warmer weather. 25 Jun 1942 Soviet 2nd Shock Army, trapped on the Volkhov River near Leningrad, Russia since 30 May 1942, was defeated; General Vlasov ordered the 180,000 survivors to break up into small groups to attempt to escape back to Soviet lines to the east; only 120,000 men would succeed. 11 Aug 1942 The German 250th Infantry Division, consisted of Spanish volunteers, was redeployed on the Volkhov River near Leningrad, Russia. 19 Aug 1942 Soviets launched the Sinyavino Offensive in the Leningrad region in northern Russia, with troops of the Leningrad Front capturing several bridgeheads across the Neva River. The Volkhov Front, however, failed to launch its offensive in concert. 24 Aug 1942 Soviet Volkhov Front launched an offensive near Leningrad in northern Russia. 27 Aug 1942 As Soviet Volkhov Front attacked toward Leningrad Russia, Soviet 8th Army attacked outwards from within the city, briefly opening a small corridor. 28 Aug 1942 Soviet 8th Army pushed forward another mile against lines held by troops of German 223rd Infantry Division near Leningrad, Russia; behind the German lines, German 18th Army moved into position to launch a counterattack. 29 Aug 1942 Soviet 4th Guards Rifle Corps joined the Soviet 8th Army in the offensive near Leningrad, Russia. 1 Sep 1942 German aircraft sank Soviet torpedo boat Purga on Lake Ladoga near Leningrad, Russia. 3 Sep 1942 An attempt by Soviet forces in Leningrad, Russia to break out of the encirclement to meet relief forces failed. 5 Sep 1942 The front lines of the Soviet Volkhov Front offensive reached within 3.5 miles from the Leningrad Front on the other side, nearly breaking the German siege on Leningrad, Russia, but the offensive would soon peter out. 10 Sep 1942 Another attempt by the Soviet forces to break out of Leningrad, Russia failed. 12 Jan 1943 Operation Spark: Soviets launched an offensive to restore communication and over-land supply route to Leningrad, Russia. 18 Jan 1943 Operation Spark, which commenced 6 days earlier, successfully opened a corridor into Leningrad, Russia on this day. The Soviet government announced the end of the siege, although that state would still continue until 27 Jan 1943. 14 Apr 1943 Soviet 14th Army pushed back a German thrust southeast of Leningrad, Russia. 15 Jan 1944 Soviet forces launched a new offensive near Leningrad, Russia. 27 Jan 1944 The 872-day siege of Leningrad, Russia was relieved by Soviet forces after suffering 200,000 military and 1,200,000 civilian deaths. The German 18.Armee in the region was withdrawn to the Luga River. more info about operation spark?